Wildlife Challenge is an outdoor environment and obstacle course designed around animal species living on the fringes of the city. An experiment in rapid exhibition prototyping and developing, Wildlife Challenge was developed, designed and installed within 100 days, using unconventional exhibition design tactics. The graphic designer graffiti spray painted the graphic panels. A cast of volunteers weaved twigs and branches over several weekends to create a man-made thicket. Team members harvested the bamboo stalks from a local bamboo forest and foraged the twigs and branches from the Liberty State Park. A departure from the conventional graphic standards, the interpretation texts were written in Haiku. The resulting exhibition was bold, bright, and richly textured. The contrast between urban and nature was reflected in the use of materials - tree stumps and bamboo juxtapose with reclaimed concrete and plastic sewer pipes. Aluminum graphic panels mounted like road signs, punctuating the natural landscape, introducing each new activity and directing traffic through the obstacle course. 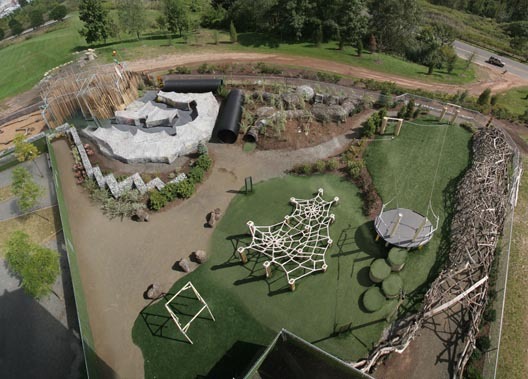 With an outdoor setting contrasting against the urban landscape, Wildlife Challenge provides opportunities for visitors to balance, crawl, swing and climb through a series of kinesthetic challenges, mimicking the activities and strategies of animals.